Marwencol is a small town in Belgium during World War 2. It is completely populated by women – the men having been slaughtered by Nazi soldiers. As the story begins they save a downed American pilot, Captain Hogie who, after he recovers opens a bar that becomes famous for it’s staged “catfights”. The alter ego of Mark Hogancamp, Captain Hogie is the anchoring character in an ongoing drama that helps Hogancamp rehabilitate himself from a vicious attack that left him brain damaged. 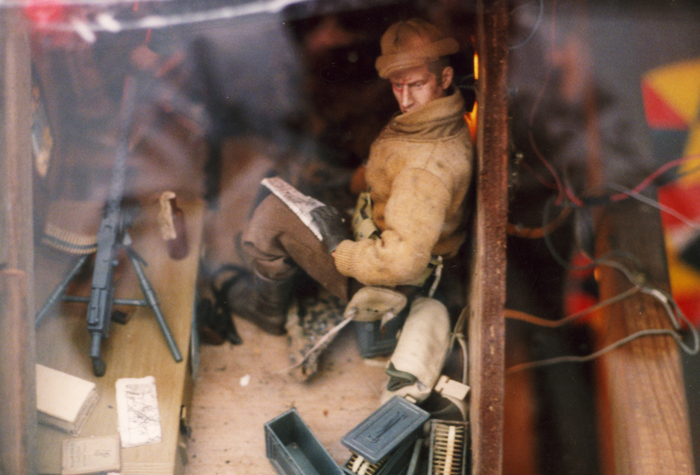 Marwencol itself is literally ‘a little town’ at 1/6th scale and is populated by Barbies and other Barbie-sized dolls. 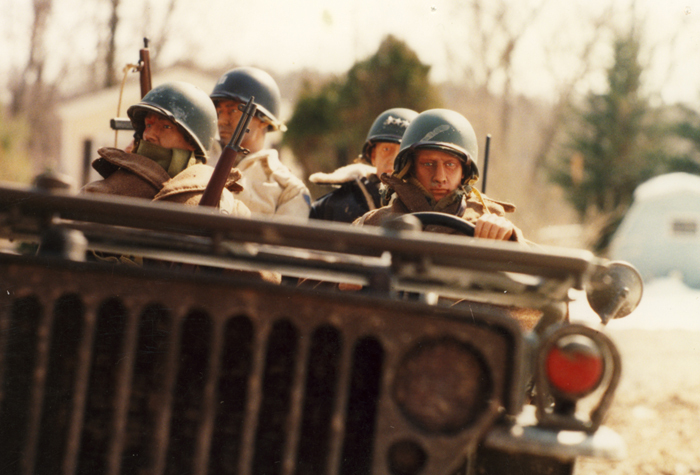 Events in Marwencol are more than simply parallel allegory or a retreat into fantasy, although they have resonance in both, they give Hogancamp a way to re-discover himself. The attack left big gaps in his memory and abilities; he had to re-learn the basics, to walk, talk, and eat. His coordination and simple ability to think coherently were severely impaired. He has almost no memory of his former marriage, raging alcoholism, Naval service, or stints in jail. He’d forgotten his fondness for women’s shoes and clothing. Hogancamp’s portraits, if they had been of actual human events, would depict those small unscripted moments of life, not the heroic acts and poses, but what goes on in between. All of it steeped in the fear and sometime brutality of a World War Two-like alternate universe and captured with the eye of a photographer from Life magazine. His sense of position, of body language, is remarkable, and that is what gives Hogancamp’s creations enough heft to easily allow the viewer to replace the peach colored plastic with flesh. Remember now, this isn’t art by some bohemian in a loft (no, there’s nothing wrong with being a bohemian in a loft, it’s just an example…) but began as a way for Mark to deal with the world around himself after his state-sponsored physical and occupational therapy ran out. I came across Mr Hogancamp and his art via a documentary called, appropriately enough, “Marwencol“. It is a fascinating look at the man and his unusual art. For a further look at his photographs there is a good sized gallery at his website at Marwencol.com and check out his video archive at Vimeo.